What is the governing body's role in teacher appraisal? This article sets out the main duties placed on governing bodies, and links to the DfE's model policy on teacher appraisal. We also look at the regulations on teacher appraisal in maintained schools. The Education (School Teachers’ Appraisal) (England) Regulations 2012 set out the rules on teacher appraisal in maintained schools. Academies are free to determine their own appraisal process and may adopt the requirements for maintained schools if they wish. Governing bodies have additional duties in relation to the appraisal of the headteacher. Another article from The Key has more information on headteacher appraisal. The DfE has published standards to be used to assess the performance of teachers in maintained schools. The Governance Handbook sets out governors' responsibilities in relation to appraisal more widely. ... scrutinise the content of the school’s draft appraisal policy carefully to make sure that it will support effective appraisal in the school, challenging the headteacher as appropriate. The handbook says the school's appraisal policy and procedures should be kept under review and amended as necessary. How should appraisal inform professional development and pay? 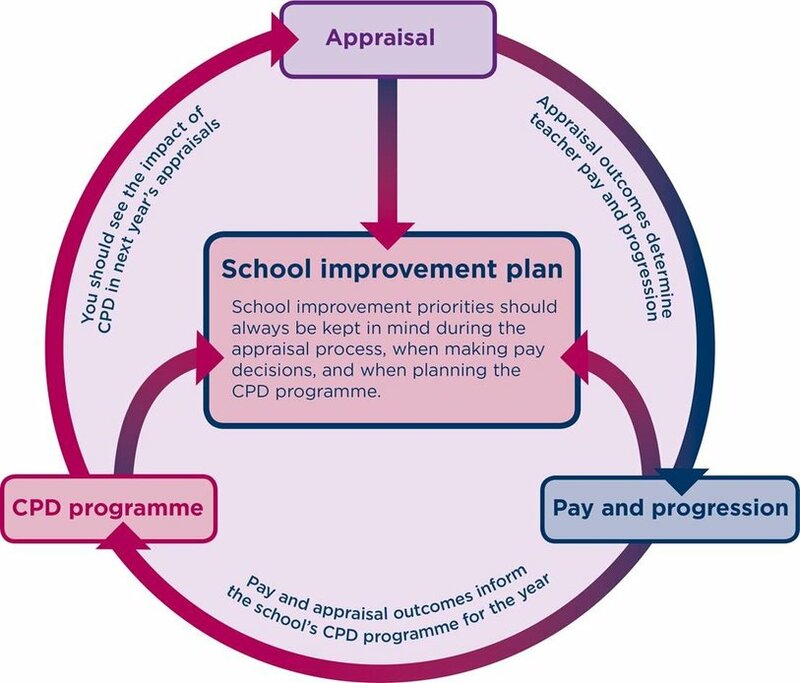 We have produced the following diagram to show how appraisal, continuing professional development (CPD) and pay should inform one another. The DfE has also published a model policy for teacher appraisal based on the 2012 regulations. While the document is aimed at maintained schools, academies may also find it useful when thinking about their appraisal policy. ... has been provided as an optional resource for schools and others to which they can refer as they wish as they review and develop their own policies. Within the document, bold text is used to denote information that is required by the 2012 regulations. The governing body and headteacher will monitor the operation and effectiveness of the school’s appraisal arrangements.